For millions of Californians, it may be the best of times. But for millions more, struggling to find stability even in an expanding economy, it sure doesn’t feel like it. 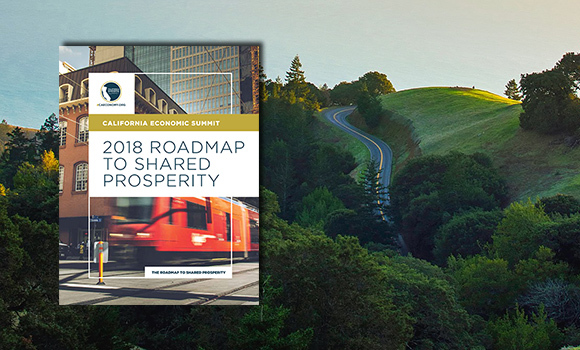 Today, with the release of the 2018 Roadmap to Shared Prosperity, the California Economic Summit has launched an updated strategy for taking on this challenge—and for bridging the growing divides that continue to imperil the state’s future. Stocks and corporate earnings may be up, buoyed by an unprecedented stretch of economic growth, but homeownership is down—to levels unseen since World War II. California’s innovative businesses are defining global trends and generating enormous wealth—and its climate policies have positioned the state to dominate a new era of industry. But five million Californians are still stuck in minimum wage jobs. More than 100,000 people are living on the streets. Automation, stagnant wages, and lengthening commutes are eroding workers’ sense of security. And with each passing generation, fewer young people in California are doing better than their parents. This widening sense of disparity—and disquiet about the future—isn’t unique to California, of course. It is the source of political turmoil and division all over the country. This is the theme of the Summit’s 2018 Roadmap, an updated action plan for taking on the multifaceted threats to the state’s prosperity. Since the first Summit in 2012, the Summit has emerged as one of the state’s only venues for leaders from the public, private, and nonprofit sectors to work together on initiatives aimed at the challenges of our time—promoting “triple bottom line” solutions that advance economic growth, ensure environmental quality, and provide opportunity for all. The Summit’s “One Million Challenges,” in particular, have zeroed in on the need to expand California’s skilled workforce, lower housing costs, and invest in sustainable water systems. And in the last three years, the Summit has advanced new performance-oriented investments in career technical education, developed new innovations in infrastructure finance, and created a policy framework big enough to take on the housing crisis. As millions of Californians struggle to make ends meet, Summit leaders recognize the how much more will be needed to Elevate CA—reducing income inequality, increasing economic security and community resiliency in a time of climate change, bolstering wealth generation, and restoring upward mobility. “The Summit—like the rest of us—needs to up its game. The term ‘Elevate CA’ describes the situation perfectly,” says Paul Granillo, former co-chair of the Summit Steering Committee and president and CEO of the Inland Empire Economic Partnership. “We need action that leads to results that can lift up some portion of the 18 million Californians who live in or near poverty." At the 2017 Summit in San Diego, nearly 500 participants affirmed these priorities and identified several major new initiatives aimed at lifting every California community into prosperity. The last year of political turmoil at the national level has made it increasingly clear for Summit leaders who will be responsible for taking on these challenges. “The federal government was never going to solve this problem for us, no matter who occupied the White House,” as Dave Regan, president of SEIU-United Healthcare Workers and Ashley Swearengin, former mayor of Fresno and current president and CEO of the Central Valley Community Foundation, put it recently. 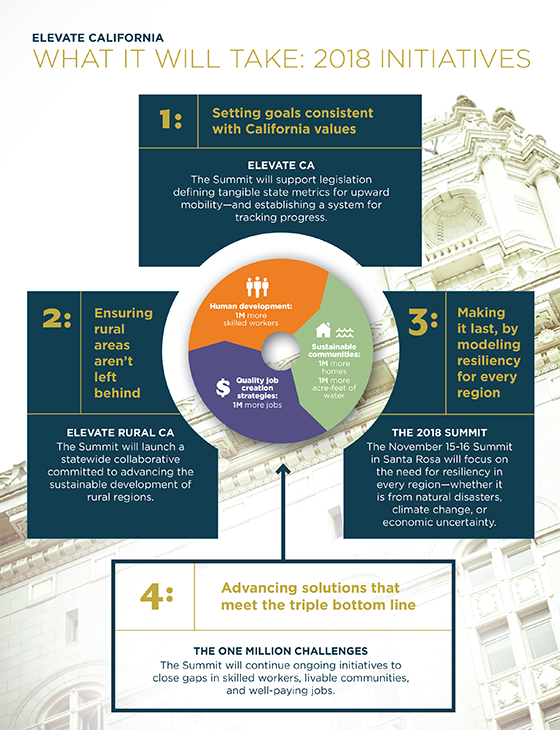 For the Summit, that work starts with a simple premise: It is time to Elevate CA.